The Newhouse School of Public Communications will be one of four schools nationwide to host an innovative new program to train journalists in the use of drones, or unmanned aerial systems, for news coverage. The program was developed by the Poynter Institute in partnership with Google News Lab, Drone Journalism Lab, National Press Photographers Association (NPPA) and DJI. Hands-on workshops at participating universities will provide training on safe drone operations as well as information for those studying to take the exam for the Federal Aviation Administration’s new Part 107 Drone Pilot’s Certificate. In addition, the three-day workshops will focus on the legal and ethical issues of drone journalism, community best practices and coordinated operations in a breaking news environment, and will explore ways drone photography can be used in innovative storytelling. 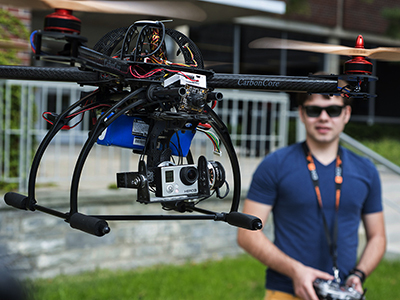 Syracuse students have been working with drones in classes taught by Dan Pacheco, Peter A. Horvitz Endowed Chair in Journalism Innovation, and through the Skyworks Project, a student group incubated in Newhouse’s Alan Gerry Center for Media Innovation that focuses on drone technology. “Every journalist now has the opportunity to cover events with flying cameras that provide a bird’s-eye view, which is extraordinary,” says Pacheco. “But it doesn’t stop there. When we combine drones with 360 video cameras and virtual reality viewers like we’re doing at Newhouse, we can give viewers the sensation that they’re actually in the drones as events unfold below them.” Pacheco and his students will show journalists participating in the workshop how to get started in 360 drone videography. Registration for the Syracuse University workshop is available online. NPPA’s legal counsel, Mickey H. Osterreicher, will participate in the workshops. Osterreicher has spoken on behalf journalists as the federal government drafted regulations for where and when drone journalists could fly. The program also will feature hands-on introductory flight training sponsored by DJI, the global leader in drone technology and 2016 winner of NPPA’s Lemen award for technology innovation in photojournalism. In addition to Syracuse University, host universities include the University of Georgia Grady College of Journalism and Mass Communication (March 17-19); University of Wisconsin-Madison School of Journalism and Mass Communication (June 16-18); and the University of Oregon School of Journalism and Communication (Aug. 18-20). The Google News Lab will support a limited number of travel scholarships for members of the National Association of Black Journalists, the National Association of Hispanic Journalists, the Asian American Journalists Association, Native American Journalists Association and NLGJA, the Association of LGBTQ journalists. Additional online training will be available later this year via Poynter’s e-learning platform, News University. Registration for each workshop will be capped at 60 people. For more information, see http://about.poynter.org/training/in-person/drones-17.